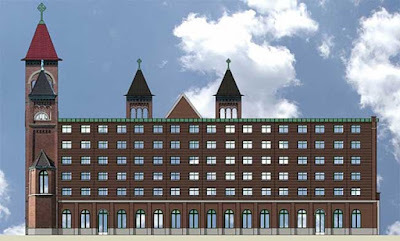 A developer's rendering shows senior housing planned for the St. Boniface site. 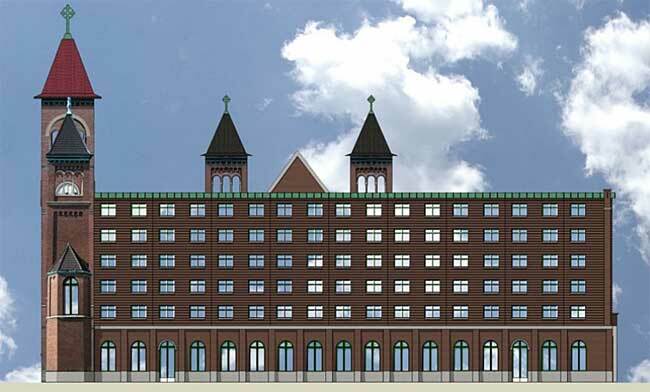 A development company, International Project Management, has proposed plans to convert the abandoned structure at Noble and Chestnut into independent senior housing that would save the four iconic towers and south facade of the church. Plans call for removal of the walls of the nave (main sanctuary space), reconstruction of the roof and demolition of the rectory. This is not the faithful restoration many had hoped for, but will maintain a semblance of the church’s dignified and prominent form, at least from the south across Eckhart Park. The deal is also not as simple as it appears. The straightforward reuse of the structure as senior housing requires legal and political contortions to maintain separation of church and state. The convoluted arrangement involves two city departments (Department of Planning & Development, Department of Community Development), three Chicago Public Schools (Byrd Elementary, Payton High School, Jones High School), two Archdiocese of Chicago churches (St. Boniface, St. Joseph) and a private developer (IPM). The first vote at the April 13 CDC meeting authorized the Department of Community Development to acquire Byrd Elementary (located at Hill Street and Orleans) from the Chicago Public Schools. A second vote authorized the CDC to sublet the school to the Roman Catholic archdiocese for 99 years, if no other acceptable offer is received. 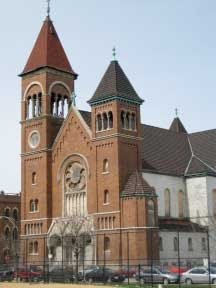 In exchange, the archdiocese will transfer ownership of the church structure and enter into a 99 year lease with the city for the land beneath St. Boniface. The archdiocese will renovate and build an addition to Byrd Elementary to expand its St. Joseph/Immaculate Conception campus across the street. Walter Payton High, which was built without a cafeteria and gymnasium, will continue to rent these facilities on the adjacent St. Joseph/Immaculate Conception campus. The Department of Planning and Development will transfer St. Boniface to IPM for development into senior housing. To further compensate the Chicago Public Schools for Byrd School, the Department of Community Development will transfer money to CPS from the South Loop Tax Increment Financing District to expand Jones High, at State Street and Harrison. The complexity of the arrangement and dedication of Ald. Walter Burnett, the archdiocese, the city and the community stand as proof that with time, effort and sincere commitment on all sides, there is always a way to save an important cultural and architectural treasure.